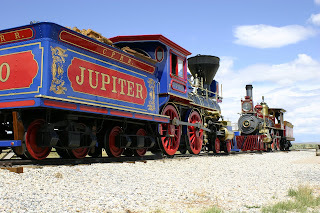 The Golden Spike Historic Site is where the transcontinental railway was completed in 1869. This is a GREAT place for kids of all ages! Click Here to visit the website and learn tips when planning your trip. Locaeted in Northern Utah in Brigham City, this is a great place to spend the day! Reenactments of the Last Spike Ceremony which took place on May 10, 1869 can be seen during the summer season. Volunteers portray the dignitaries who were here on that day in 1869. Come and be a part of history Saturdays and holidays from May 10 through Labor Day at 11:00 a.m. and 1:00 p.m. Steam Demonstrations are when the Jupiter and No. 119 locomotives move on the tracks. These demonstrations take place every day during the summer season (May 1 - Labor Day). They also have "fee free" days! Click Here to view the dates. Thanks to Bev JbAilat for this great family activity idea!